Why choose the Castlerosse Hotel? The Castlerosse Hotel is blessed with a great location for walkers. Its unique feature is that it connects directly to Killarney National Park. Without going anywhere near a busy public road, you can ramble through the National Park into Killarney town or by woodland and riverside walk along the paved Fossa Way. Ross Castle and Ross Island are within walking distance also and you can add to these a boat trip on the lake or a visit to ancient Innisfallen Island. The walks listed here are intended for the leisurely walker who enjoys the open air and spectacular scenery as well as the sense of wellbeing, activity and fitness which walking provides. 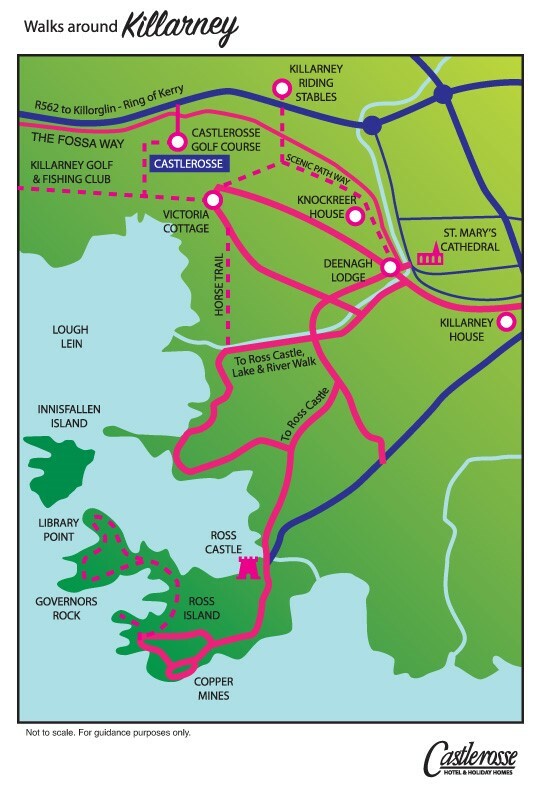 See our walking map from the Castlerosse hotel here or the walking map from Muckross House, please click here. For small groups or groups arranged by the hotel, we can provide an experienced and qualified guide who will make the most of your walk through Killarney National Park. Enjoy a pleasant walk through the tracks and trails of Killarney valley. Learn about the history, flora and fauna, wildlife and legends that shaped this unique landscape. Our guides operate to very high standards and are noted for their passion for the environment and outdoors. Their love of history and culture embrace all the green issues of our day and above all the good company of group walking. Let them be your guide, teacher, mentor and storyteller.